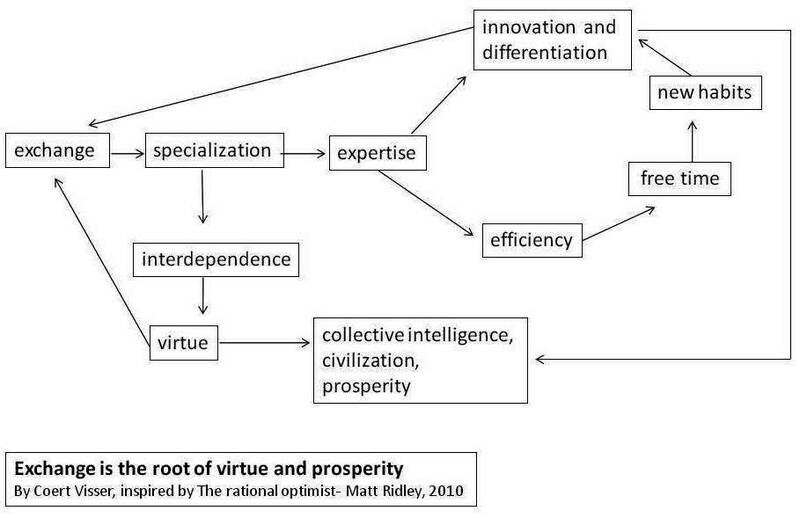 You might think that Matt Ridley's book The Rational Optimist is 'just' a long explanation of how human history has been the story of progress and that this progress is a good thing. But it is not. The book does indeed provide many examples of how things have gotten better, both in recent history and over the long haul and predicts the future will be bright. But it also provides a thought-provoking explanation of how this happened. Ridley puts forward a hypothesis of how human beings have become so successful. He says that we as a species have been able to change extraordinarily, not primarily because we have evolved so dramatically as individuals but because human intelligence became collective and cumulative in a way that distinguishes us from all other species. What triggered this process of unique cultural evolution, according to Ridley, is that, more than 100,000 years ago, people have discovered the possibility of exchanging different things with each other. It is true that other animals do know the principle of reciprocity (‘if you’ll scratch my back, I’ll scratch yours’) but to exchange one thing for a different thing is uniquely human. By starting to exchange things we discovered 'the division of labor', specialization by individuals for mutual gain. Specialization leads to expertise which made innovation possible because it provides the specialist with a reason and an opportunity to invest extra time in improving tools or techniques and developing new ones. An simplified example. If two people needed two products, A and B, they could chose to be both self-sufficient which would mean that they would both produce both products A and B for themselves. But they could also chose to be interdependent which would mean that they would exchange and specialize, in which scenario the one person would product A and the other would produce product B. This latter scenario would allow each person to specialize, which would allow them to become more skillful and efficient. They would thus become capable of producing the product more quickly which would give them time to improve and renew the product and to develop new habits and skills. When they would continue to exchange the two products both would end up with better products and prosperity and more free time would have been created. But that is not all. In addition to this, friendliness, tolerance and civility would have increased due to the fact that A and B would be aware that they are interdependent. On a larger scale, in complex networks, the same applies, providing the freeness and fairness of exchange is governed by rules. The greater the interconnected communities become, the more different habits it acquires, the more specializations it can develop and the more its collective intelligence grows. Here is my attempt to visualize this (click to enlarge). Let’s replace the old saying ‘money is the root of evil’ with ‘exchange is the root of virtue and prosperity’. What is the most solution-focused song title?